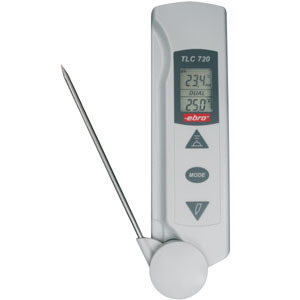 The TLC 720, Handheld Infrared Thermometers function as non-contact infrared and contact thermometers. The user can always toggle between the digital ir thermometer's two operating modes. Additionally the portable infrared thermometer has a laser pointer that helps the user aim the temperature sensor at the target when they are making measurements. The ideal distance in most applications for the non-contact digital infrared thermometers is from 4 to 12 inches, measuring a 0.8-2.5 inch diameter circle. As the distance (D) from the object increases, the spot size (S) of the area measured by the portable ir thermometer becomes larger. Make sure that the target is larger than the non-contact digital infrared thermometer's spot size. The smaller the target, the closer you should hold the handheld ir thermometer to it. When accuracy is critical, make sure the target is at least twice as large as the portable infrared thermometer's spot size. Inaccurate readings will result from using the handheld digital infrared thermometers to measure shiny or polished metal surfaces like stainless steel or aluminum. To compensate, cover the surface to be measured with masking tape or flat black paint. Allow time for the tape to reach the same temperature as the material underneath it. Use the portable infrared thermometer to measure the temperature of the tape or painted surface. When measuring a grill, for example, aim the handheld digital ir thermometer at a portion of the grill that has been blackened by the high temperatures. The portable ir thermometers cannot measure through transparent surfaces such as glass or plastic. The handheld digital infrared thermometers will measure the surface temperature of the transparent surface instead. Steam, dust, smoke, etc., can prevent accurate measurement by obstructing the non-contact digital ir thermometer's optics. Hold the non-contact infrared thermometer back and at an angle to ensure the most accurate measurements. The TLC 720 Handheld Infrared Thermometer is a handy temperature measuring instrument for various measure and control tasks in the trade, the industry, and the laboratory. Applications for the non-contact digital ir thermometer include fast, simple temperature measurements of liquids, motors, pipes, food, storage containers, received goods, supermarket areas, kitchens, and refrigerated rooms. NOTE: When measuring liquid products, be sure to stir the product vigorously while using the portable infrared thermometer to measure the surface of the liquid. Note: DO NOT submerge handheld ir thermometers in water. 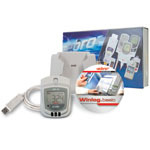 Includes EBI-20-T datalogger, Winlog.basic software, EBI-20 interface, and USB cable.